In the resort city of Pattaya in Thailand, you will never get bored. There are lots of activities that you can do while walking the streets only. The local people of Thailand are very good; they can cook amazing seafood like you have never tasted before. The street food of this city is famous all over the world. There are beautiful beaches, clear weather and lotus lakes. You will not any difficulties in finding out the comfort in hotels; they are luxurious and great at services. You can also enjoy beach foot ball organized at the beaches. Have fun with cartoons: You must check Cartoon network Water Park in Pattaya. 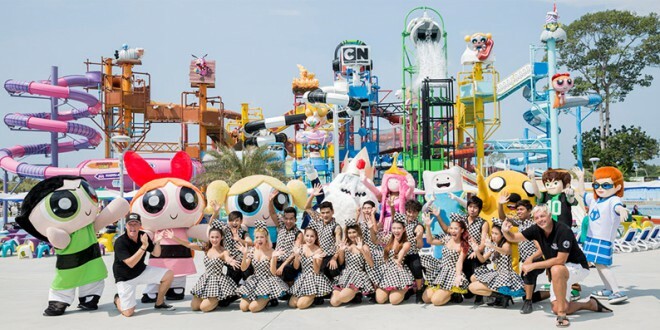 It is the world’s first water park based on cartoon network themes. You can enjoy 10 different themed zones in the park. You can experience the ultimate fun in more than 25 water slides. If you are facing any problem getting there you just need to call the water park authority and they will send transportation wherever you are in the city. It takes only 20 minutes from Pattaya to get there. The beach road: You can roam at “the beach road”. After 6 pm it becomes very similar to a night club, the vehicles are not allowed there in the evening. The bars, restaurants music go to full extent. You can see the neon lights dazzling, many vendors are selling in their own style and it’s just amazing. Shop from floating market: The Pattaya floating market is famous all over the world. The vendors there have traditional boats on which they sell fruits, handicrafts, arts, souvenirs and more stuff in the local river. View the city: You can also view the whole city from the view point at Pratumnak hills. You can visit this point day and night. It really gets emotional for some people to have a last view of the city who had a lot of great time in this beautiful city with their friends.